discovered the fundamental law for the science of hydraulics. Pascal's law tells us that pressure on a confined fluid is transmitted undiminished in every direction, and acts with equal force on equal areas, throughout the confining vessel or system. According to Pascal's law, any force applied to a confined fluid is transmitted in all directions throughout the fluid regardless of the shape of the container. Consider the effect of this in the systems shown in views A and B of figure 3-4. If there is resistance on the output piston (view A, piston 2) and the input piston is pushed downward, a pressure is created through the fluid which acts equally at right angles to surfaces in all parts of the container. If the force 1 is 100 pounds and the area of input piston 1 is 10 square inches, then pressure in the fluid is 10 psi ( 100 10). It must be emphasized that this fluid pressure cannot be created without resistance to flow, which, in this case, is provided by the 100-pound force acting against the top of the output piston 2. 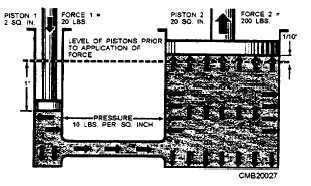 This pressure acts on piston 2, so for each square inch of its area, it is pushed upward with the force of 10 pounds. In this case, a fluid column of a uniform cross section is considered so the area of output piston 2 is the same as input piston 1, or 10 square inches; therefore, the upward force on output piston 2 is 100 pounds - the same as was applied to input piston 1. All that has been accomplished in this system was to transmit the 100- pound force around a bend; however, this principle underlies practically all-mechanical applications of fluid power. At this point, it should be noted that since Pascal's law is independent of the shape of the container, it is not necessary that the' tubing connecting the two pistons should be the full area of the pistons. A connection of any size, shape, or length will do so long as an unobstructed passage is provided. Therefore, the system shown in view B of figure 3-4 (a relatively small, bent pipe connects the two cylinders) will act the same as that shown in view A. Figure 3-4. 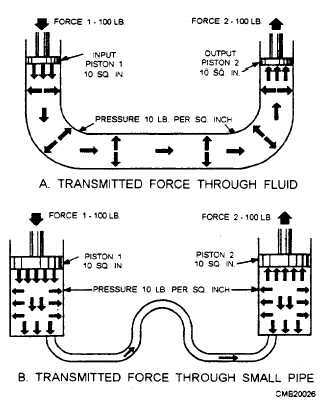 - Force transmitted from piston to piston. the pressure is the same because the force is concentrated on a relatively small area. This pressure of 10 psi acts on all parts of the fluid container, including the bottom of output piston 2; therefore, the upward force on output piston 2 is 10 pounds for each of its 20 square inches of area, or 200 pounds (10 x 20). In this case, the original force has been multiplied tenfold while using the same pressure in the fluid as before. In any system with these dimensions, the ratio of output force to input force is always 10 to 1 regardless of the applied force; for example, if the applied force of input piston 1 is 50 pounds, the pressure in the system is increased to 25 psi. This will support a resistant force of 500 pounds on output piston 2.